I can’t imagine many rational reasons anyone would need a keyboard designed to coincide with the colors of the Super Nintendo, but I have to admit there’s something soothing about the rows of gray, lilac, purple and black keys of Hyperkin’s “retro-style” Hyper Clack keyboard. 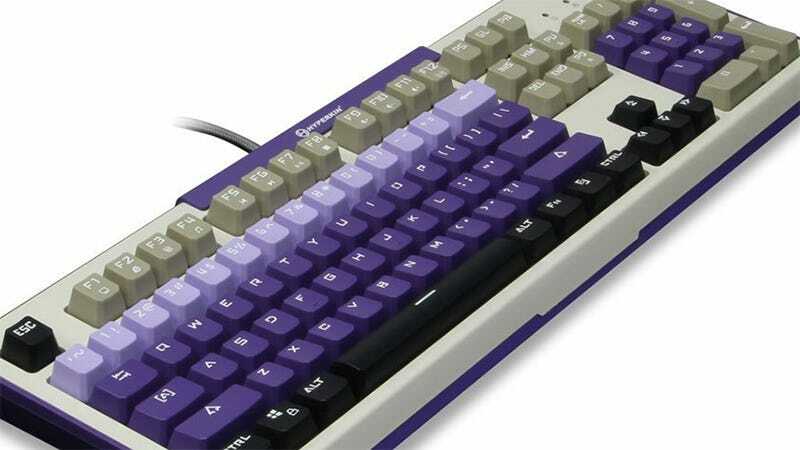 Recently unleashed upon the retail world, the SNES-styled Hyper Clack here is a $99 USB mechanical keyboard designed to appeal to the retro gaming enthusiast. With its Gaote Blue tactile switches and Cherry MX compatible keycaps, it seems like it’s a nice enough typing instrument. It even sports a pleasing purple glow along the base. It’s just so . . . odd. Do I get one and set my SNES up next to it? Should I be retro-styling all of my PC peripherals? So many questions. The Hyper Clack SNES edition comes in a themed box, and I’m still not sure how to feel.